A genetic analysis conducted by the U.S. Geological Survey recently confirmed that larval, or newly hatched, fish collected by researchers at The University of Toledo from the Maumee River during summer 2018 are grass carp, one species of invasive Asian carp that threaten the Great Lakes. The Maumee River is a tributary to Lake Erie. These young fish are the first grass carp collected in their larval stage from within the Great Lakes watershed. Other life stages, including fertilized eggs, juveniles and adults, have been previously documented in tributaries and shoreline areas of Lake Erie. Identifying locations with larval grass carp in the Maumee River will help inform management decisions and allow natural resource agencies to better focus limited resources on grass carp removal efforts. These images taken by Nicole King, aquatic ecology research technician at The University of Toledo Lake Erie Center, show grass carp larvae from the Maumee River. Characteristics of larval grass carp include overall length, left, skeletal muscle development, center, and presence of an eye spot that lacks pigmentation (pigment starting to develop on lower eye). On June 13 and 26, 2018, a sampling crew from The University of Toledo collaborating with the U.S. Geological Survey sampled the Maumee River in Toledo for early life stages of grass carp. The larval grass carp were collected near the I-280 bridge in the city of Toledo and near the river mouth adjacent to Brenner’s Marina during high water flow events typical of spawning conditions for grass carp. While the samples were being processed in January 2019, six larval fish resembling grass carp were identified. These larval fish were sent to the U.S. Geological Survey for genetic confirmation. Scientists analyzed DNA extracted from each larva in early February and confirmed with high confidence that the species of every hatchling was grass carp. Subsequent genetic sequencing of the larval fish DNA in late February confirmed that the larvae were grass carp. The capture of these larval grass carp confirms previous evidence that they spawn in the Maumee River, and the capture of larvae during separate high flow events confirms the possibility of more than one successful spawning event within a year. This new discovery does not indicate the population size in the Maumee River, but underscores the continued need for early detection. The U.S. Geological Survey and The University of Toledo have previously documented grass carp spawning in the Sandusky River. For more information about the threat of Asian carp in the Great Lakes, visit the U.S. Geological Survey Great Lakes Restoration Initiative website. A University of Toledo researcher who studies embryonic development has received a $448,500 research grant to further understanding of how the central nervous system’s extraordinarily precise connections are made in the first few weeks of life. With that information, it might be possible to address brain disorders such as epilepsy, schizophrenia and dyslexia during development, or to rewire the central nervous system in people who have had strokes or spinal cord injuries. The three-year grant from the National Institutes of Health’s Eunice Kennedy Shriver National Institute of Child Health and Human Development will enable Dr. Guofa Liu, associate professor in the UT Department of Biological Sciences, to study the role of microRNA in mapping the central nervous system. The brain and spinal cord each have two sides, which link together to control everything from movement to the sense of touch. Those connections between the two sides are made early. Commissural neurons in a developing embryo send out a tiny fiber known as an axon that finds its way to a corresponding target cell to link the two sides of the central nervous system. Scientists know there’s a process that works almost like a relay race as the axons cross the midline of the central nervous system. As the axon approaches and crosses the embryonic midline, there’s a sort of molecular switch that hands off guidance from one side of the central nervous system to the other. MicroRNA are tiny molecules that work as biological programming to regulate gene expression. Liu’s previous research has suggested they play a key role in the handoff as axons cross from one side of the central nervous system to the other. Work funded by the new grant will dig deeper into how that molecular switch actually works. Beyond understanding how the central nervous system develops, the new knowledge could be applied toward nervous system regeneration in individuals impacted by paralysis. 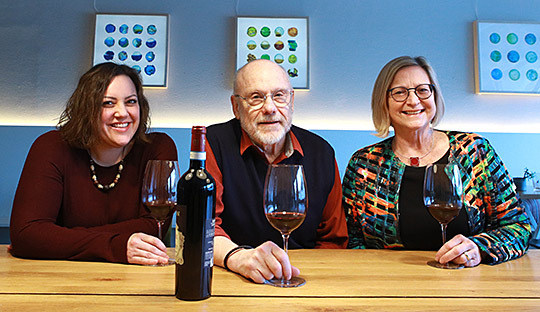 A team of scientists at The University of Toledo uncovered new, galling details in the intimate relationship between insects and plants, opening the door to new possibilities in protecting the source of wine and raisins worldwide from a major agricultural pest. The biologists discovered grape phylloxera — the insect that nearly wiped out wine production at the end of the 19th century in France — hijacks a grape vine’s reproductive programs to create a leaf gall, which it uses as a pseudo apartment for the parasite to siphon off the plant’s nutrients. The research is published in the latest issue of Nature Scientific Reports. The researchers studying how insects control grape vines are, from left, Dr. Melanie Body, postdoctoral associate in the Department of Environmental Sciences; Dr. Jack Schultz, senior executive director for research development; and Dr. Heidi Appel, dean of the Jesup Scott Honors College and professor of environmental sciences. A gall is an organ a little smaller than a marble on a plant that can look like a wart, flower or fruit and provides insects with a protected place to feed and reproduce. 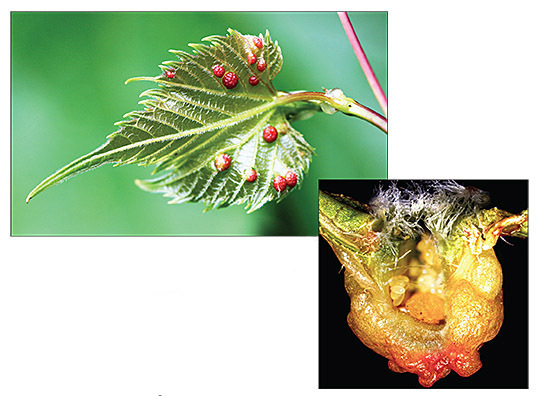 “When galls form on a leaf, the flower genes are on. They shouldn’t be activated, but the insect is manipulatively inserting its own signals into the pathway to get a flower-like result,” said Dr. Heidi Appel, dean of the Jesup Scott Honors College at The University of Toledo and professor in the Department of Environmental Sciences. The insect lays an egg and starts the process to exploit the plant’s reproductive genetic machinery, directing the plant to create these structures. Insects have set up house in phylloxera galls on this leaf. This cross-section of a gall taken with a stereosmicroscope shows an insect mom — the orange ball in the center — surrounded by eggs she laid — the yellow ovals. Appel and Dr. Jack Schultz, senior executive director for research development at The University of Toledo, said Charles Darwin guessed at the idea in 1867 when he observed that the gall bears a certain degree of resemblance to the inside of a peach when cut open. Galls damage grape vines by draining resources and getting in the way of photosynthesis, resulting in lower yields. By identifying the genes in grape vines that have to be activated for an insect to produce a gall, scientists can next find a way to block the insect from attacking the plant. Friday, Feb. 22, is the deadline to register for Partners for Clean Streams’ 17th annual Youth Patch Day Workshop. The event will be held Sunday, March 3, from 1:30 to 4:30 p.m. at The University of Toledo’s Lake Erie Center, 6200 Bayshore Road in Oregon. The Patch Day Workshop is open to second- through fifth-grade students interested in learning about conservation, as well as Cub Scouts or Girl Scouts seeking to fulfill merit and environmental badge requirements. This year’s workshop theme is “Habitats” and will feature presenters from the city of Oregon, the city of Perrysburg, Wood Soil & Water Conservation District, Lucas Soil & Water Conservation District, the UT Lake Erie Center, and Black Swamp Bird Observatory. In addition, there will be hands-on activities. This program is an excellent way for youth and their leaders to learn more about their roles in protecting the environment. Registration can be done online at the Partners for Clean Streams website. Cost is $5 per participant and must be paid prior to the event. For more information, call the Partners for Clean Streams office at 419.874.0727. We often hear about the psychological benefits of reconnecting with nature. Take a walk. Listen to birds chirping. Plant flowers. Bringing people back into harmony with nature also can save wildlife. The University of Toledo Lake Erie Center is hosting a free, public event about community-level solutions to wildlife conservation in an increasingly urban landscape. 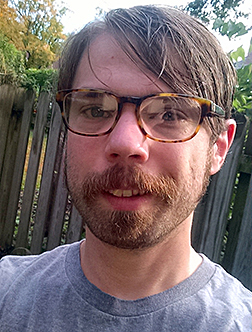 Matthew Shumar, program coordinator for the Ohio Bird Conservation Initiative and co-editor of “The Second Atlas of Breeding Birds in Ohio,” will give a talk titled “It Takes a Village” Thursday, Feb. 21, at 7 p.m. at the Lake Erie Center, 6200 Bayshore Road in Oregon. 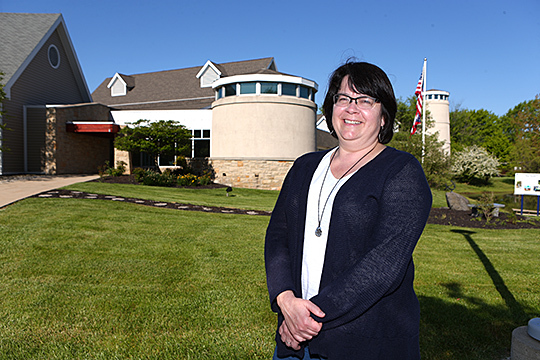 The avian ecologist plans to speak about the Ohio Bird Conservation Initiative’s Lights Out program designed to address light and glass issues that threaten birds in urban areas. Streby studies rare songbirds and red-headed woodpeckers. His groundbreaking migration research revealed the key to population declines in golden-winged warblers. The Ohio Bird Conservation Initiative is a collaboration of nonprofit groups, businesses, citizens, and state and federal agencies working to advance bird conservation efforts. Shumar’s talk is part of the Lake Erie Center’s Public Lecture Series. A shuttle will be available to transport passengers from UT’s Main Campus to the Lake Erie Center and back. The shuttle will depart at 6:15 p.m. from the south side of Bowman-Oddy Laboratories, 3100 West Towerview Blvd. Passengers must reserve a spot. Email lakeeriecenter@utoledo.edu or call 419.530.8360 to make a reservation for the shuttle. The Lake Erie Center is UT’s freshwater research and science education campus focused on finding solutions to water quality issues that face the Great Lakes, including harmful algal blooms, invasive species and pollutants. Water quality is a major research focus at UT. With more than $14 million in active grants underway, researchers are looking for pathways to restore our greatest natural resource for future generations. 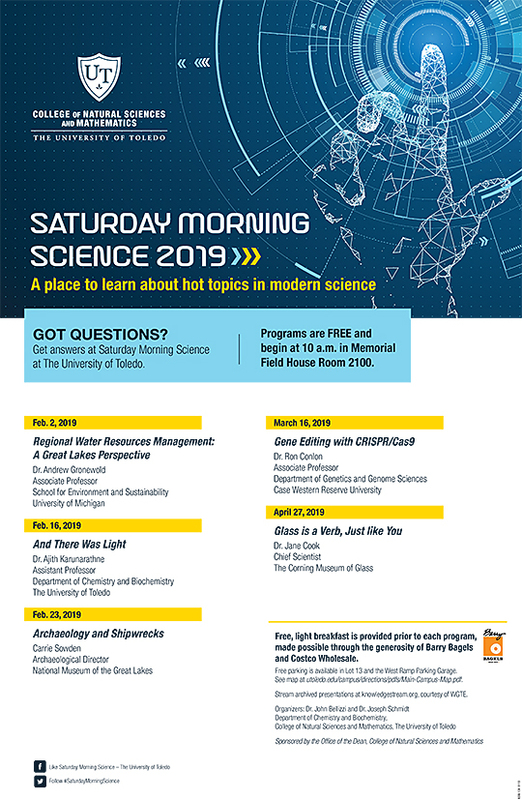 Saturday Morning Science is back for 2019 at The University of Toledo with five programs to give the community the opportunity to learn about hot topics in modern science. The free, public talks, which are presented by the UT College of Natural Sciences and Mathematics, kick off Saturday, Feb. 2, at 10 a.m. in Memorial Field House Room 2100 with “Regional Water Resources Management: A Great Lakes Perspective,” presented by Dr. Andrew Gronewold, associate professor in the School for Environment and Sustainability at the University of Michigan. • Feb. 16: “And There Was Light” by Dr. Ajith Karunarathne, assistant professor in the UT Department of Chemistry and Biochemistry. • Feb. 23: “Archaeology and Shipwrecks” by Carrie Sowden, archaeological director of the National Museum of the Great Lakes. • March 16: “Gene Editing with CRISPR/Cas9” by Dr. Ron Conlon, associate professor in the Department of Genetics and Genome Sciences at Case Western Reserve University. • April 27: “Glass Is a Verb, Just Like You” by Dr. Jane Cook, chief scientist at the Corning Museum of Glass. All talks begin at 10 a.m. and include complimentary light refreshments donated by Barry’s Bagels and Costco Wholesale Corp. The program is funded by the Office of the Dean of the College of Natural Sciences and Mathematics. For more information about the upcoming events, visit the Saturday Morning Science’s Facebook page. Plenefisch will lead the college effective Tuesday, Jan. 15, while Dr. Karen Bjorkman serves in her new role as interim provost and executive vice president of academic affairs. Plenefisch, who joined UT in 1996, is an associate professor of biological sciences. Prior to joining UT, Plenefisch worked at Johns Hopkins University and the University of Connecticut. He earned his PhD from the Massachusetts Institute of Technology and a bachelor’s degree from the University of Connecticut. The UT Lake Erie Center announced Monday afternoon this talk is canceled. The University of Toledo Lake Erie Center is hosting a free, public event about the collaborative efforts to re-establish a self-sustaining lake sturgeon population in the Maumee River. Dr. Chris Vandergoot, research fishery biologist with the U.S. Geological Survey, will give a talk Thursday, Jan. 17, at 7 p.m. at the Lake Erie Center, 6200 Bayshore Road in Oregon. 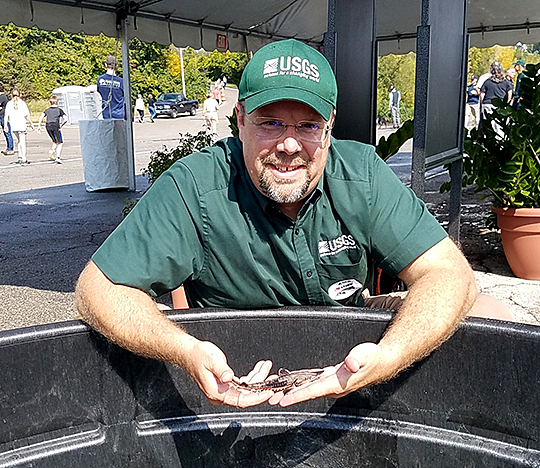 Dr. Chris Vandergoot, research fishery biologist with the U.S. Geological Survey, held a young lake sturgeon prior to its release in the Maumee River last fall. “We want to bring awareness to the importance of the Maumee River watershed and restore a native fish species to the Lake Erie ecosystem,” Vandergoot said. UT is a partner in the regional, state and federal teamwork to restore giant, ancient sturgeon to Lake Erie that culminated in thousands of juvenile sturgeons being released into the Maumee River in October. Vandergoot is an expert in using acoustic telemetry to track fish. Acoustic telemetry involves implanting fish with special tags that produce sound that can be detected by a large network of receivers installed around the Great Lakes. It is a way to determine where fish are moving within the lakes and learn about their behavior and habitat use. Some of the sturgeon released into the Maumee River last year have these tags. Two years ago, a UT graduate student helped the Toledo Zoo secure $90,000 in federal grant money to build a sturgeon rearing facility along the Maumee River. Dr. Jessica Sherman-Collier, who has since received her doctorate in ecology from UT, assisted the project by verifying that spawning and nursery habitat still exist in the Maumee River to sustain a population of the fish that can live to be 150 years old and grow up to 300 pounds and eight feet long. Water quality is a major research focus at UT. With more than $14 million in active grants underway, researchers are looking for pathways to restore the greatest natural resource for future generations. Vandergoot’s talk is part of the Lake Erie Center’s Public Lecture Series. The University of Toledo’s research in immune therapy and precision molecular therapy for treating cancer was acknowledged in 2018 as an area of emerging research excellence with the potential to generate national attention. At UT’s second Cancer Research Symposium held late last year, Dr. Christopher Cooper, executive vice president for clinical affairs and dean of the College of Medicine and Life Sciences, told assembled faculty and students from across the University they must all work together to turn that potential into reality. 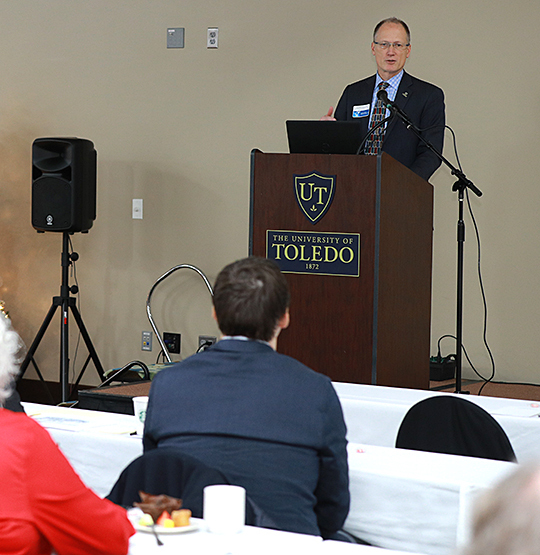 Dr. Christopher Cooper, executive vice president for clinical affairs and dean of the College of Medicine and Life Sciences, delivered the opening remarks for the 2018 UT Cancer Research Symposium. The event, held last month, focused on the work of UT researchers whose findings are advancing precision cancer therapies. The symposium, attended by more than 120 physicians, research scientists and students, was focused on UT’s efforts to create a precision cancer therapy program that will develop more targeted treatments thanks to the huge scientific advances in how we understand not just cancer, but the way it affects specific individuals. It was only two decades ago that scientists decoded the human genome and just a decade ago that scientists first sequenced one individual’s DNA. At the time, those were extraordinarily lengthy and expensive projects. Today scientists can sequence an individual’s DNA for roughly $1,000, said Dr. F. Charles Brunicardi, director of the Cancer Program in the College of Medicine and Life Sciences. The symposium featured nearly two dozen UT faculty presenters from the College of Medicine and Life Sciences, College of Pharmacy and Pharmaceutical Sciences, and College of Natural Sciences and Mathematics who discussed topics including genomic sequencing, immunotherapy for breast cancer, novel drug discovery, and how drugs already approved by the U.S. Food and Drug Administration might be able to be repurposed for cancer treatment. The event also featured a keynote address from Dr. Jian-Ting Zhang who provided perspectives on establishing a targeted drug discovery program. 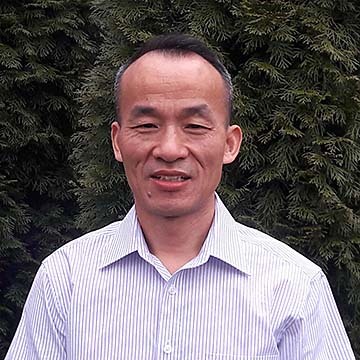 Zhang, formerly professor of pharmacology and toxicology at the Indiana University School of Medicine, will join UT as chair of the Department of Cancer Biology in the College of Medicine and Life Sciences in February. “This is the best of academia, where we bring together people from different disciplines and different approaches and we tackle important problems that matter to our community, our region and our world,” Cooper said. More information about the symposium and the presented research can be found by visiting the UT Cancer Research Symposium website. Dr. Karen Bjorkman, dean of the College of Natural Sciences and Mathematics since 2010, will lead academic affairs starting Tuesday, Jan. 15. 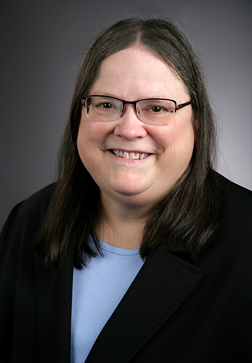 Bjorkman, also a Distinguished University Professor of Astronomy and the Helen Luedtke Brooks Endowed Professor of Astronomy, has been a member of the UT faculty since 1996 when she joined the Department of Physics and Astronomy. Dr. Andrew Hsu, who has served as UT’s provost since 2016, has been named the president of the College of Charleston in South Carolina. He will work with Bjorkman for several weeks to ensure a smooth transition and complete his tenure at UT at the end of February. The president thanked Hsu for his leadership in implementing the University’s strategic plan and initiatives to enhance student success. 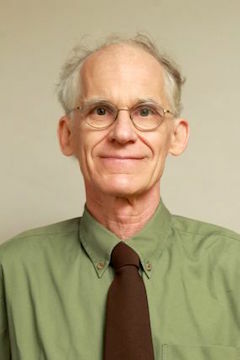 Bjorkman is a leader in the research field of stellar astrophysics, applying spectropolarimetry to better understand the variable gaseous disks around massive stars. Her research has focused on studying the physical characteristics of these disks and the mechanisms behind their formation and variability. In 2017, Bjorkman was named a Fellow of the American Association for the Advancement of Science, the world’s largest multidisciplinary scientific and engineering society, in recognition of her important contributions to scientific discovery. “I look forward to working with faculty across the breadth of our colleges to support their research and creative scholarship, to continue to improve and enhance our student success outcomes, and to build bridges between STEMM areas, professional schools, and the arts and humanities so that we ensure our graduates have the wide range of skills and experiences they need to be successful in today’s increasingly interdisciplinary world,” Bjorkman said. Prior to joining UT, Bjorkman was a scientist in the University of Wisconsin’s Space Astronomy Laboratory and a systems engineer for Martin Marietta Denver Aerospace. She earned her PhD and master’s degrees in astrophysics from the University of Colorado, Boulder, and a bachelor’s degree in physics from the University of North Carolina, Chapel Hill. The University plans to conduct a national search for provost at the beginning of the next academic year.